WE ARE CHANGING LOCATIONS IN CHA! Accelerated, Inc. is a full-service regional expedited motor carrier. The company operates scheduled line haul service between our branch locations on a daily basis. Most of these cities are served overnight. The outermost points of the network are second day. The hub terminal located in Atlanta, GA, services all cities next day with the exception of Houston, which is second day. The Company provides service to hundreds of cities and thousands of zip codes on a same-day basis. 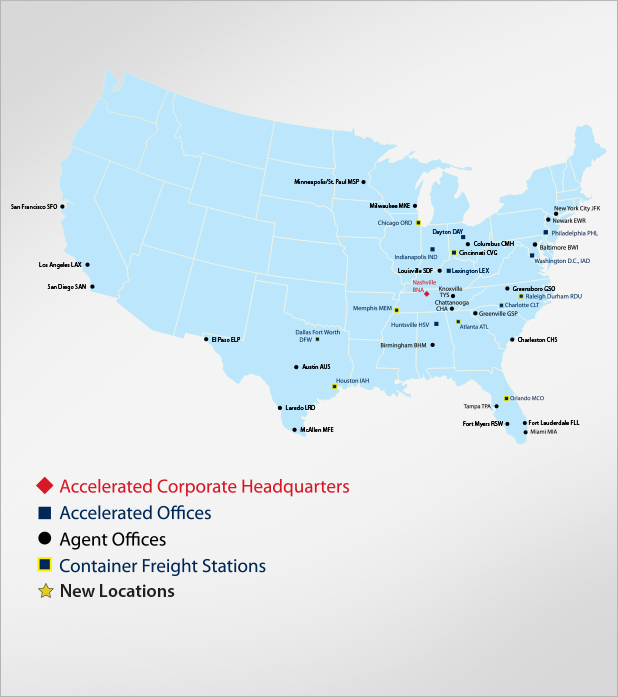 Accelerated’s corporate office is located in Nashville, TN, where it began business in 1977. Accelerated has tailored its operation to the needs of freight forwarders, airlines, and integrators. The cutoff times and arrival are scheduled to meet the requirements of those customers. By utilizing Company drivers and equipment, Accelerated is able to maintain the control required to create a network that is distinguished by its consistency. Accelerated uses day cabs, sleepers, straight trucks (w/ lift gate capabilities), and cargo vans. All trailers and rollerbeds are air-ride equipped as well. Please contact us to request a quote and/or for spot rates on shipments.